A backyard swing can take you back to the time when you were young and spent countless hours in the backyard playing on the swing set. This collection of backyard swing plans will take you back to the days of old and give you that same carefree feeling in a more sophisticated and grownup way. They will be a great gathering spot to relax, read, visit with family and friends, or just enjoy the outdoors. Take a look at our selection and discover your inner child. 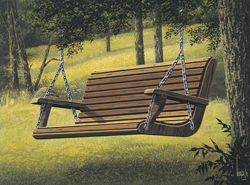 Our collection of backyard swing plans includes many types and styles that will make your backayrd a place of nostalgia. We offer easy-to-follow drawings so you can build your very own. With a wide variety of plans, we are sure that you will find the perfect do-it-yourself project to fit your needs.